One for your diary, gents. 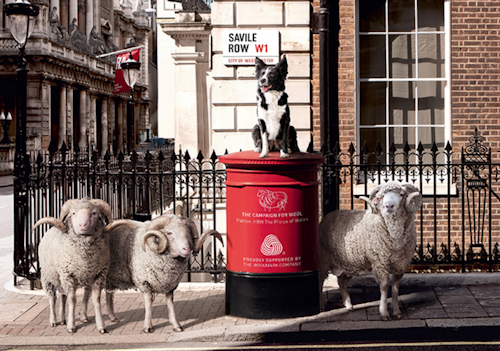 The Campaign for Wool launches its sixth annual Wool Week on the 5th of October (10 till 6) by letting (actual) sheep loose on Savile Row. The street will be laid with turf and transformed into an ersatz pasture representing the landscapes of Britain and New Zealand. Exmoor Longhorn and Merino sheep will be mingling with humans along the Row for this intriguing little inter-species shindig. The tailors along the Row are joining in with the fun by keeping open house and giving access to their archives. The Row's tailors have also partnered with leading mills to create and showcase bespoke creations that exhibit the versatility and beauty of woollen fabrics for the event. If the sheep flocking around the street reminds you that you need a clipping, demon barbers Murdock London will be quartered in a 'shearing shed' offering themed grooming treatments during the day.